Spring in Algonquin Park comes later than surrounding areas as a result of the Park's higher elevations. When snow and ice have left Toronto or Ottawa, Algonquin Park is often still very wintry. 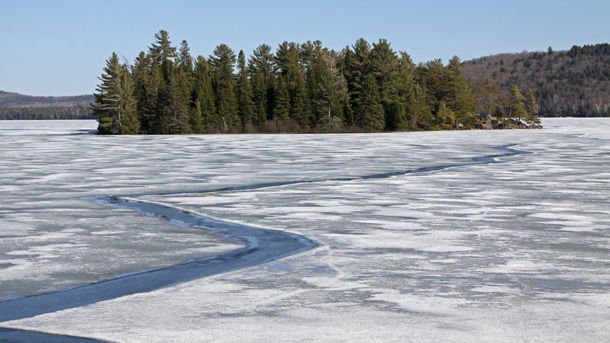 Ice on Algonquin's lakes usually remains until the last week of April or the first week of May. The average date for ice out on Lake Opeongo in Algonquin Park is April 28 (1964 - 2016). Algonquin Park has some of the best Brook Trout and Lake Trout fishing in Ontario. In some years, anglers hoping to head into the backcountry for their first Brook Trout or Lake Trout fishing trip are delayed by iced lakes or impassible Access Point road conditions (e.g. deep snow, mud, washouts, etc.). Many anglers now delay their trip until a week or two after the opening of trout fishing season to ensure ice free conditions and easy access. Algonquin Park is a very special fishery and thus has special regulations to ensure the protection of the Park's fragile fisheries. If you will be fishing in Algonquin Park, ensure you are aware of the Park's special fisheries regulations including a ban on the possession (and use) of live baitfish. Spring offers the year's best Moose viewing and you typically don't have to search very hard to see Moose. 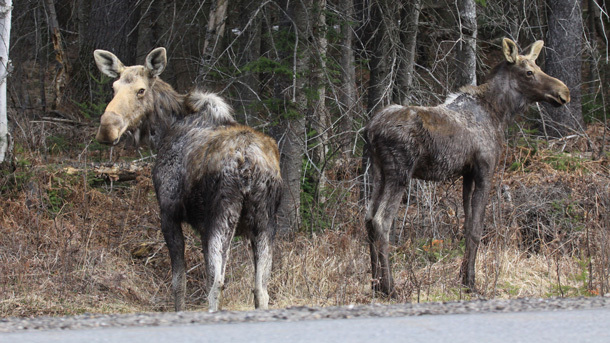 The application of salt to Highway 60 during winter road maintenance operations, attracts Moose to roadside ditches. Moose with salt deficient winter diets, capitalize upon this unnatural source of salt and chances are you'll see a half dozen or more of these magnificent animals during a leisurely drive along Highway 60 on a May morning or evening. Moose (and other wildlife) pose a serious danger to drivers. Stay alert as Moose can be on the road or standing in roadside ditches and are often surprisingly hard to see. Each year Moose and other wildlife are killed in vehicle collisions. Reduce your speed (especially at night) and help save the lives of Algonquin Park's Moose and possibly even your own. If you see a Moose, pull onto the shoulder and off the traveled portion of the road and turn on your hazard lights to warn other drivers. If drivers flash their vehicle headlights at you in Algonquin Park, there's a good chance a Moose is ahead or maybe even a "Moose Jam" (a traffic jam caused by Moose watchers). If you exit the vehicle, watch for traffic and ensure you keep a safe distance from wildlife. If you are watching a Moose and it flattens its ears the length of its body (rather than ears pointing to the sky), you are too close and you should back up. Learn more about wildlife watching in Algonquin Park. 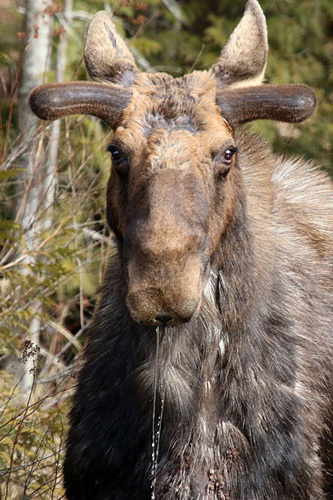 Check The Friends of Algonquin Park's Facebook Page for spring Moose images and sightings. Stay tuned for spring workshops coming soon. From late April into May, a select group of wildflowers called “spring ephemerals” grow and bloom in the brief window between the spring snow melt and leaf-out of the overhead canopy of trees. Once the canopy has filled in, very little light reaches the forest floor and many of these wildflowers go into dormancy until the next year, staying alive as a rootstock underground. 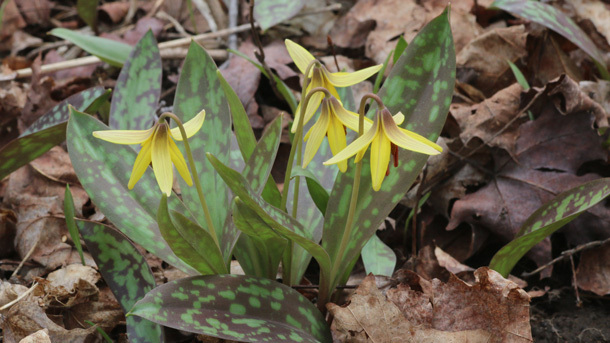 Algonquin Park's interpretive walking trails are a great location to observe spring wildflowers. 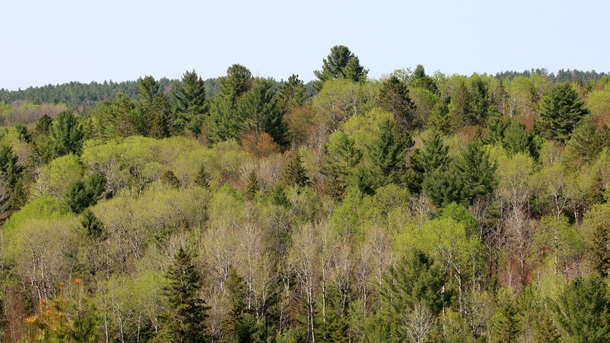 During the first few weeks of May, take in the beauty and subtle hues of Algonquin's spring colours. Enjoy the pastel green of Trembling Aspen leaves, the pink wash of distant Red Maples, the white of cherry blossoms, and the silvery puffs of the Largetooth Aspen. 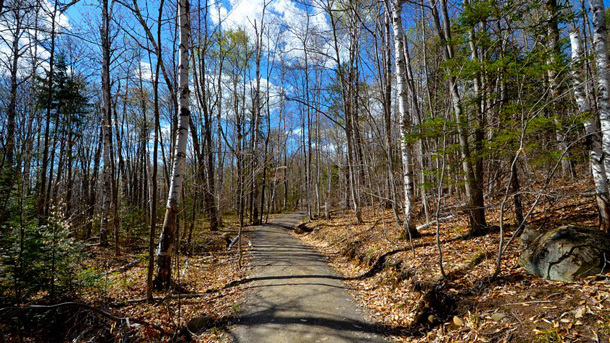 Spring is the time of blackflies and mosquitoes in Algonquin. Biting insects typically emerge in late-May and can remain abundant until late-June. In wet years, mosquitoes remain throughout the summer in shady wet areas and also emerge at dusk to feed. Learn how to prepare yourself against these biting insects so you can enjoy a spring visit to Algonquin. Teachers, clubs, and other groups may wish to take advantage of the Group Education Program offered through The Friends of Algonquin Park. Programs are available for all age groups and offered in half-day, full-day and sleepover formats and focus on the natural and cultural history of Algonquin Park. Various Park facilities open at different times of the year to accommodate an increasing number of visitors during the spring/early summer season. See the Events Calendar for exact dates and times, but general opening dates are listed below. Your safety in Algonquin Park – as elsewhere – is ultimately your responsibility. Be prepared! A spring visit requires special care and attention. A last blast of winter can surprise unprepared visitors sometimes into May. Cold water in the first month or so of the open water season can be deadly. Use care with paddling on icy cold water. When using portages and interpretive trails, be cautious about fall trees, flooded conditions and other hazards and backcountry rangers or interpretive trail crews need time to clear winter hazards such as fallen trees blocking portages or trails. As with other times of the year, cellular telephone coverage is not Park-wide; generally it is limited to 3 kilometres on each side of Highway 60 and, even in this area, service can be "none" to "limited."